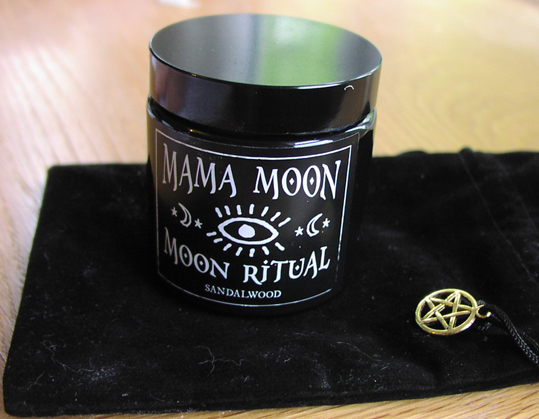 This lovely Mama Moon candle in a black witchy bag was among the gifts I was given at the Hay House Witch Blogger party last week. Mama Moon is run by Semra, who makes candles for a whole variety of magical purposes including moon rituals (like the one in the picture), healing, meditation and spellwork. As she says on her website: "Mama Moon Candles are candles made by my spiritual warrior self (that’s Semra for those who don’t know me!) and are individually hand poured by me in London in my flat with my cat, or familiar as I like to call him ;)"
Candles and cats are among my two favourite things - as you can see I even managed to get some cat fur on the black velvet bag before I photographed it! You can visit the Mama Moon online shop here: https://www.mamamooncandles.com/shop and you can also buy the candles at Shes' Lost Control, a new magic and meditation supplies shop at 42 Valentine Rd, London E9 7AD. And, while I'm on the subject of candles, I have to give a little plug for my own book - Pagan Portals - Candle Magic - a witch's guide to a whole variety of spells and rituals using candles.